Share this product and receive a $0.70 sharing discount. Are you always worried that your kids have cavities? It’s understandable since 42% of children between the ages of 2 and 11 have had cavities in baby teeth and 21% of children ages 6-11 have had cavities in permanent teeth. Fortunately tooth decay is preventable. You can give what your child’s teeth need with Kid’s Spry Tooth Gel. 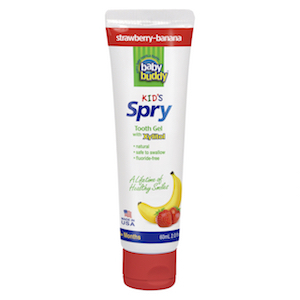 Kid’s Spry Tooth Gel has xylitol, a natural sweetener your kids will love. But xylitol is also good for your child’s dental health. It has unique properties which don’t let bacteria stick to teeth and gums. Because the bacteria can’t adhere, they can’t grow and flourish, which means your child’s teeth don’t have anything eating away at them. It was formulated specifically with children in mind and is completely safe to swallow. Natural Strawberry Banana Flavor is one of the most popular flavors and loved by everyone. Sweetened with 100% xylitol to naturally promote oral health and ensure proper tooth development. Fluoride-free formula is safe to swallow and can be used by kids 3 months and older. Dentist recommended due to its effectiveness in promoting oral health at a young age. Natural ingredients so you don't need to worry about giving your child artificial sweeteners and other chemicals. Administer 3-5 times daily to gums and teeth. Suggested times are after feeding/eating and before bedtime. Purified Water - Purified through reverse osmosis and is used as a carrier and solvent. Xylitol - Sourced from non-GMO corncobs and stalks and is used as a natural sweetener, a moisturizer, and for its anti-adhesive effect on bacteria. Calcium Glycerophosphate - Sourced from a mineral deposit and is used as a mineral supplement for remineralization. It protects the enamel in teeth and balances the pH. Cellulose Gum - Sourced from plants and is used as a thickening agent. Natural Strawberry and Banana Flavoring - Sourced from a variety of plans and is used to infuse a delicious flavor. Grapefruit Seed Extract - Sourced from non-GMO grapefruit seeds and is used as a natural preservative.